Though the 21st century is often described as the Information Age, Milind prefers to view it as the Communication Age. As internet and mobile connectivity have penetrated deeper and deeper into India, the capacity for individuals and organizations to share information has reached unprecedented heights. Some find this level of communication frightening, but for Milind it represents an extraordinary opportunity to connect directly with his constituents. If in the the past voters communicated with their representatives only through the collective act of voting, today a citizen has the freedom to make his or her voice heard through any number of social media tools – often directly, without mediation, in real time. For Milind, this freedom of communication means an even greater responsibility to reach out to his constituents. Milind has kept abreast of new technologies as they have gained momentum in the public sphere. 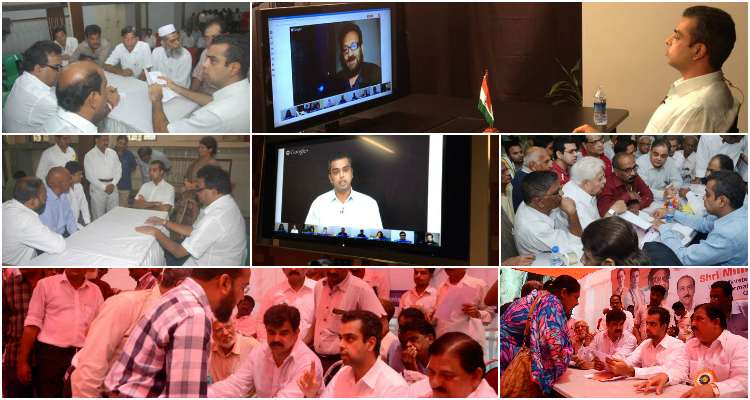 Milind’s weekly Janata Darbar initiative and frequent interactive sessions using Google Hangout give people – and particularly tech savvy young voters – the chance to raise the questions that matter most to them. Milind also uses more traditional modes of communication, such as his fortnightly newsletter, to keep a close connection with all his constituents. Milind has become an active participant in the world of social media, communicating through facebook and contributing his two cents to the global conversation taking place every hour of every day on Twitter. As anyone who keeps abreast of the news cycle well knows, social media has become more than just a tool for connecting with people – it has also become an important tool for effecting change as an individual citizen. Milind has used social media to encourage active participation from young people through initiatives like @UthSpeak, and has used Twitter as a platform to voice his own ethical and political stances. When his own party supported an ordinance to preserve the positions of convicted lawmakers, Milind used Twitter to speak out against that ordinance, eventually garnering enough support to withdraw it.